Brumadinho (Brazil): Hope that loved ones had survived a tsunami of iron ore mine waste from a dam collapse in Brazil was turning to anguish and anger over the increasing likelihood that many of the hundreds of people missing had died. Da Silva said she last spoke to her son before he went to work on Friday, when around midday a dam holding back mine waste collapsed, sending waves of mud for kilometres and burying much in its path. Employees of the mining complex owned and operated by Brazilian mining company Vale were eating lunch on Friday afternoon when the dam gave way. “I saw all the mud coming down the hill, snapping the trees as it descended. It was a tremendous noise,” said a tearful Simone Pedrosa, from the neighbourhood of Parque Cachoeira, about 8 kilometres from where the dam collapsed. In addition to the 40 bodies recovered as of Saturday night, 23 people were hospitalised, said authorities with the Minas Gerais fire department. There had been some signs of hope earlier Saturday when authorities found 43 more people alive. Over the weekend, state courts and the justice ministry in the state of Minas Gerais ordered the freezing of about $1.5 billion (Dh20.4 billion) from Vale assets for state emergency services and told the company to present a report about how they would help victims. Brazil’s Attorney-General Raquel Dodge promised to investigate, saying “someone is definitely at fault.” Dodge noted there are 600 mines in the state of Minas Gerais alone that are classified as being at risk of rupture. 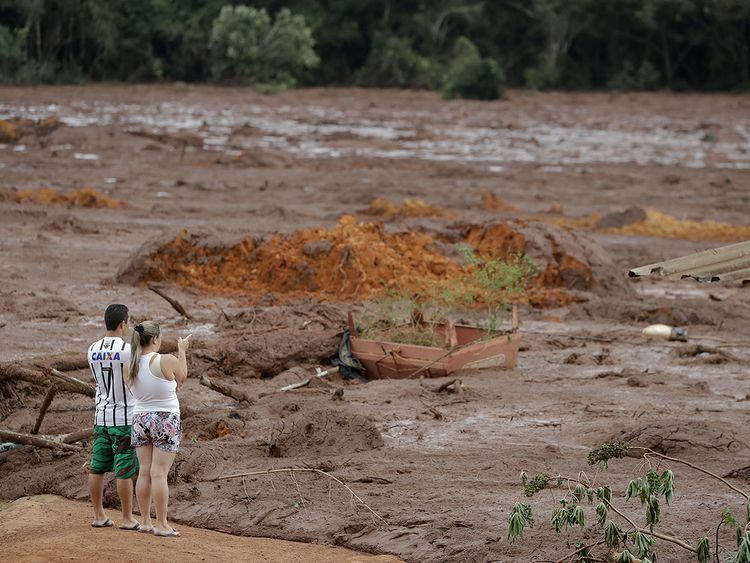 Another dam administered by Vale and Australian mining company BHP Billiton collapsed in 2015 in the city of Mariana in the same state of Minas Gerais, resulting in 19 deaths and forcing hundreds from their homes. Considered the worst environmental disaster in Brazilian history, it left 250,000 people without drinking water and killed thousands of fish. An estimated 60 million cubic metres of waste flooded rivers and eventually flowed into the Atlantic Ocean. Daily Folha de S. Paulo reported Saturday that the dam’s mining complex was issued an expedited license to expand in December due to “decreased risk.” Preservation groups in the area alleged that the approval was unlawful.